Stephen E. Ambrose has written 5 books that appear on various military reading lists. Here are those books along with the lists that included them, past and present. 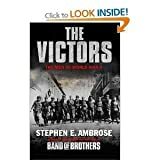 Liked Ambrose's books on D-Day, The Band of Brothers and Pegasus Bridge more than this. This one, coming near the end of his career, feels more like a synthesis of his earlier works rather than a good extension (with new material). Made me re-think the whole hurry up and wait. Very informational. Something I keep under my bathroom sink. One of my favorite World War II books. My favorite book on D Day still remains the classic "The Longest Day", but this one by Ambrose (as well as works by Keegan and others) are good updates/expansions. Hopefully the third volume in Atkinson's "Liberation Trilogy" will be the capstone to this period of the war. The story of one unit in the Western Front during WWII. Also an excellent miniseries (but I liked the book better). I also enjoyed "Pegasus Bridge" by Ambrose, which looks at one unit during one action on D-Day.